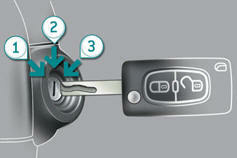 Turn the key fully towards you to position 1 (Stop) . After switching off the engine (position 1-Stop ), you can still use functions such as the audio and telematics system, the wipers, the dipped headlamps, the courtesy lamps, etc. for a maximum combined period of thirty minutes.